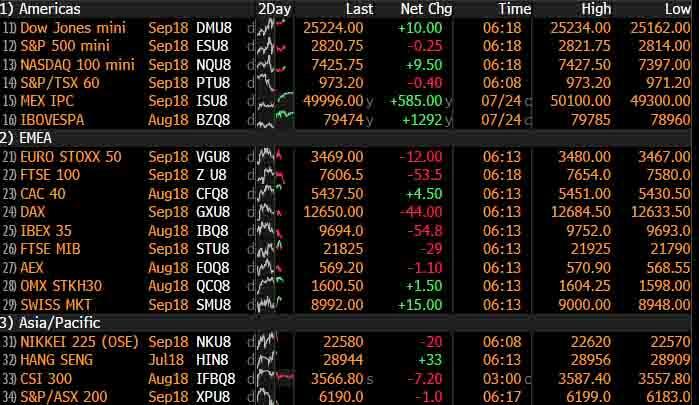 A three-day global stock rally stalled on Wednesday, with Asia and Europe mixed, as investors digested the latest set of earning while waiting for the outcome of a meeting between President Donald Trump and the EU Jean-Claude Juncker to see where the global trade war was heading next. Nasdaq futures pointed to a slightly firmer open, while S&P 500 futures were flat. Europe's Stoxx 600 Index fluctuated in a narrow range after a mixed bag of earnings from Deutsche Bank and Banco Santander. Earlier, Asian stocks inched higher after Wall Street had hit a five-month high, extending a month-long advance, though Shanghai stocks edged lower as positive sentiment spurred by Beijing’s willingness to support the Chinese economy showed signs of fading. In some good news for China, the yuan eased off a 13-month low, with the onshore yuan rising by the most since July 9 as the dollar weakened which also soothed some nerves, while most major currencies, bond benchmarks and oil were tucked in tight ranges. Markets struggled to build on Tuesday’s upbeat session as trade relations between the US and Europe returned to the fore. The meeting between Trump and Juncker, the man he once described as a “brutal killer” takes place after the U.S. president sent a Twitter message demanding both sides drop all tariffs, barriers and subsidies, before claiming the Europeans wouldn’t. The talks threaten to overshadow the steady stream of company earnings, with results due from the likes of General Motors and Facebook. Earlier on Wednesday, EU trade commissioner Cecilia Malmstrom told a Swedish newspaper on Wednesday that the bloc was preparing to introduce tariffs on $20 billion of U.S. goods if Washington imposes levies on imported cars. Separately. the latest monthly Ifo survey of German business confidence also showed some impact from the row, although there was no major plunge and traders in most markets seemed content to hold positions steady. The dollar index, which measures the greenback against a basket of six other major currencies was just off a two-week low at 94.506 and barely budged at $1.1692 against the euro and 111.24 yen. The yield on the 10-year Treasury note, which tends to act as the benchmark for global borrowing costs eased to 2.937 percent, after climbing to a six-week peak of 2.973 percent overnight. Bond yields were pushed up this week on speculation the Bank of Japan is edging closer to unwinding its aggressive stimulus program. In commodities, Brent crude fut were up 0.6 percent at $73.89 a barrel, adding to the previous day’s gains as market focus shifted away from oversupply concerns to the possibility of increasing Chinese demand. Copper on the London Metal Exchange (LME) traded down at $6,264 per tonne after soaring 2.7 percent overnight to a two-week peak of $6,328.00 on Chinese stimulus hopes. Iron ore on the Dalian Commodity Exchange touched a two-month peak of 479.5 yuan a tonne, while precious metal gold was a touch higher at 1,228 an ounce. Expected data include mortgage applications and new-home sales. Boeing, Coca-Cola, Fiat Chrysler, GM, UPS, Facebook, Ford, Las Vegas Sands, Qualcomm and Visa are among companies reporting earnings. As both China and the U.S. now hint at the possibility of restarting talks, Beijing is worried that it might get played again, according to three Chinese officials who asked not to be identified discussing strategy. Australia’s inflation remained subdued in the three months through June, suggesting the central bank’s interest-rate pause will enter a third year. Ireland would back any request by the U.K. to stay in the EU after March 2019, Irish Foreign Minister Simon Coveney said, the first senior EU official to publicly raise the prospect of Brexit being delayed. Asian stocks were mixed with macro drivers on the light side and after the region failed to sustain the momentum from the positive US close where earnings dominated focus. ASX 200 (-0.3%) was negative amid broad weakness across the index aside from the commodity-related sectors, while materials names and continued strength in Japanese banks kept the Nikkei 225 (+0.5%) afloat. Elsewhere, Hang Seng (+0.9%) and Shanghai Comp. 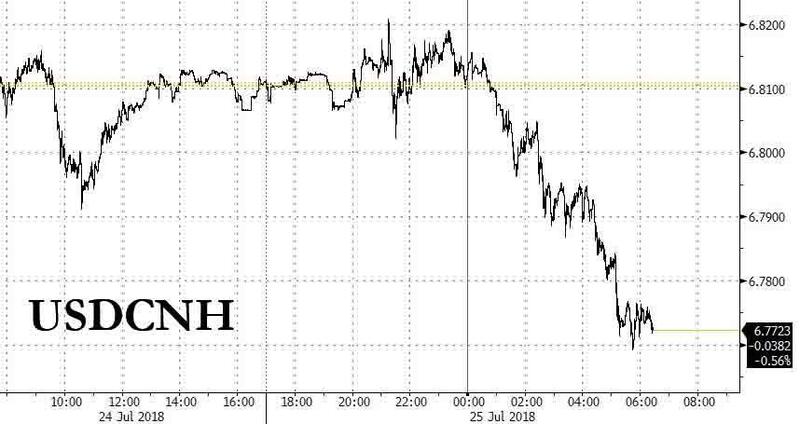 (-0.1%) were varied as Hong Kong was led higher by oil names including Sinopec which expects its highest H1 profit since 2013 and with the mainland less decisive following a liquidity drain by the PBoC, while the KOSPI (-0.3%) was dampened on earnings including LG Display. Finally, 10yr JGBs gained overnight and broke above this week’s highs in a continuation of its recent rebound and with the BoJ present in the market for JPY 650bln of JGBs in the belly to super-long end, while reports also noted BoJ watchers viewed the central bank was unlikely to tighten policy before October and some even believed there were prospects of looser policy. BoJ is seen by experts as unlikely to tighten monetary policy before October despite speculation the bank may act at its upcoming meeting due to the impact of its ultra-loose policy, while reports also noted that some believe further easing is on table to support inflation. EDF Raises Flamanville Cost Again as Plant Delayed by a Year. In FX, there has been minimal movement in Dollar pairings, as the index continues to pivot around the 94.500 axis looking for more direction that might emanate from US-EU trade talks later rather than data in the form of new home sales. However, some signs of a shift in sentiment overnight and potential change in the recent trend of further Yuan depreciation post-PBoC Usd/Cny fixing, as both the on-shore and off-shore units hold above 6.8000. CAD/CHF/GBP/EUR - All mildly firmer vs the Usd, but rangebound, with the Loonie sitting near the base of a 1.3165-35 band, Franc at the low end of 0.9945-25 parameters and Cable holding above 1.3150 after an uptick in UK mortgage apps, and ahead of CBI trades. Meanwhile, not a lot of reaction to slightly better than anticipated German Ifo survey readings or Eurozone money supply from the single currency that is nestling just under 1.1700, and 0.8900 vs the Pound, with more focus on tomorrow’s ECB policy meeting and any further policy guidance (even though unlikely given QE and rate signals delivered only last month). JPY - Usd/Jpy meandering between 111.15-40 and still delicately poised around a 111.25 Fib, while latest reports on the end of month BoJ meeting suggest no change in policy likely until October, and in stark contract to sources perhaps even more easing rather than any hawkish tweak (per so called ‘experts’).EM - Aside from the aforementioned Cny and Cnh counter-moves, other EMs, including the Try, have recouped more losses vs the Greenback, with the Mxn aided by latest positive NAFTA noises to rebound further from 20.000 and through 19.000. In commodities, WTI trades flat, straddling just above USD 68.50/bbl, whilst Brent eyes USD 74.00/bbl to the upside. Last night’s API Crude inventories printed a larger than expected drawdown (-3.160M vs. Exp. -2.300M), tempering oversupply concerns that have weighed on markets recently. Of note, an IMF report commented on the steep inflation rise in Venezuela (while sanction risks remain), which has subsequently limited its ability to boost oil output. (Of note: Venezuelan oil production fell to a new 30-year low of 1.5mln BPD in June). Traders will be watching today’s DoE Crude inventories which are expected to show a draw of 2.331M barrels. Gold (+0.3%) gradually crawls higher as USD strength eases. Copper is flat while traders are eyeing the latest developments at the world’s largest copper mine, BHP’s Escondida in Chile. The Anglo-Australian miner had made its final offer with the union regarding an increase in wages, markets await further updates. On a fairly quiet day for headlines yesterday, one story really stood out. According to the IMF, Venezuela’s inflation rate is expected to hit 1,000,000% by the end of this year, a situation only really comparable to Germany in the 1920s and Zimbabwe in the 2000s. It was only back in April that the IMF predicted inflation of ‘just’ 13,000% for Venezuela this year, which now looks tame by comparison. Instead their new forecast implies prices rising by about 3.9% a day. Quite unbelievable. There weren’t quite the same eye-opening moves in markets yesterday but it was for the most part still a fairly decent day for risk despite a bit of a fade in the latter half of the US session. The news about China loosening the fiscal purse strings and another solid day for corporate earnings appeared to be the catalysts while the PMIs in Europe and the US were a bit more mixed but the details did throw up some interesting takeaways. More on that below. expectations. Only one company missed on both and it means that we’re now running at 106 out of 116 companies beating earnings expectations and 88 out of 116 beating revenue expectations. UBS also posted better than expected results in Europe which contributed to a +2.23% rally for the Stoxx Banks index – the biggest one-day gain since June 11th. How markets continue to trade today might depend on what we get from President Trump’s meeting with European Commissio.n President Juncker and EU Trade Commissioner Malmstrom in Washington. Warming up for the meeting President Trump tweeted yesterday that “Tariffs are the greatest! Either a country which has treated the United States unfairly on trade negotiates a fair deal, or it gets hit with Tariffs”. Overnight he also tweeted that “The European Union is coming to Washington tomorrow to negotiate a deal on Trade. I have an idea for them. Both the US and EU drop all Tariffs, Barriers and Subsidies! That would finally be called Free Market and Fair Trade! Hope they do it, we are ready – but they won’t”. Juncker goes to the meeting aiming to compromise on Trump’s auto tariff threat,0 although the FT pointed out that it may not be that easy to achieve tangible progress. For example a plurilateral tariff cutting deal involving the world’s biggest vehicle producers may also require approval from China as it’s a big manufacturer of car parts or concessions from the US on its the existing 25% duty on light trucks. Conversely a bilateral deal between the EU and US may also involve changes that the two sides are hesitant to make, such as opening up more of .the agriculture market in the EU. So it should be interesting. On a related note, Reuters has reported that the US administration will provide around $12bn of relief aid to US farmers to partly offset the flow on impacts from the trade conflict with China/EU. Coming back to the PMIs, in Europe the flash July composite for the Eurozone .printed at 54.3 which was half a point below the consensus and a drop of 0.6pts .rom June. Driving the fall was the services reading which fell 0.8pts to 54.4 (vs. .55.1 expected). In contrast the manufacturing reading (55.1 vs. 54.7 expected)0 rose 0.2pts and for the first time this year, although it’s worth flagging that new export orders did fall to the lowest since August 2016. The data for the core countries was also fairly mixed with Germany surprising to the upside (55.2 vs. 54.8 expected) after the manufacturing reading came in at an impressive 1.4pts higher compared to June, while France’s composite fell 0.5pts to 54.5 (vs. 54.9 expected). Our economists in Europe flagged that the data implies around a 1.5pt. fall for the data in the non-core but that the broader Eurozone composite is at levels still consistent with +0.5% qoq GDP growth in the region. Meanwhile in the US the composite PMI nudged down 0.3pts to 55.9 primarily as a result of a 0.3pt fall in the services reading to 56.2 (vs. 56.3 expected). The manufacturing PMI actually unexpectedly rose 0.1pts to 55.5 (vs. 55.1 expected). It’s worth noting that the US release included more references to pricing pressure with output prices rising 1.4pts to 56.4 and the highest since the series began in 2009. The associated statement noted that “robust input cost inflation persisted across the private sector in July, which was attributed to increased fuel bills, higher staff salaries and rising raw material prices”. The statement also made an unsurprising reference to tariffs, stating that “Trade frictions have clearly become a major cause of concern, especially among manufacturers. Firms have become increasingly worried about the impact of tariffs and trade wars on demand, prices and supply chains”. Speaking of rising prices, here in the UK yesterday the government announced that around 1 million public sector workers will receive a pay rise. This follows last year’s decision to lift the 1% cap on public sector pay rises and the delayed response to that should finally start to feed through into the data from now .on (it’s likely that the pay rises are backdated to April). Meanwhile the latest Brexit announcement was that PM May was to take control of Brexit talks. DB’s Oliver Harvey made the point that May has now made official what has been the practical case for some time however, that is the cabinet office is leading negotiations with the Brexit department deputizing. Markets were fairly nonmoved post the news with Sterling spending most of the day gently rising versus the Dollar. In terms of the remaining data from yesterday. In the US, the July Richmond Fed index was above market at 20 (vs. 18 expected) and pointed to further inflation pressures. In the details, the new orders index was steady mom at 22 while the prices paid and prices received index rose 3.5% and 2.2% yoy respectively, with the latter at the highest since December 2012. Back in the UK, the July CBI trends total orders index eased 2pts mom to an above market print of 11 (vs. 8 expected). Meanwhile the CBI noted that unit costs in the UK manufacturing industry grew at the fastest pace in one year for the three months to July, while also flagging that inflation pressures are expected to ease “only marginally” over the next quarter. Finally the July ECB bank lending survey showed that bank credit standards have eased for corporate, mortgage and consumer loans in Q2, while lending demand rose for these three categories. Looking ahead to Q3, lenders expect rising loan demand and further net easing in bank credit standards for all of the loan categories. Looking at the day ahead, in Europe we'll get June PPI for France along with the July IFO survey for Germany, July CBI retailing reported sales in the UK and M3 money supply data for the Euro area for June. In the US, June new home sales is the only data due out. Away from the data, as noted earlier European Commission President Jean-Claude Juncker and the EU trade chief Cecilia Malmstrom will meet with US President Donald Trump to discuss averting a new round of U.S. tariffs on European car imports. Finally key earnings releases for the day include Coca-Cola, General Motors, Facebook and Boeing.